Fan Angle refers to the angular spread of a laser beam, and determines the size of a projection (such as a line or cross) at a particular distance. 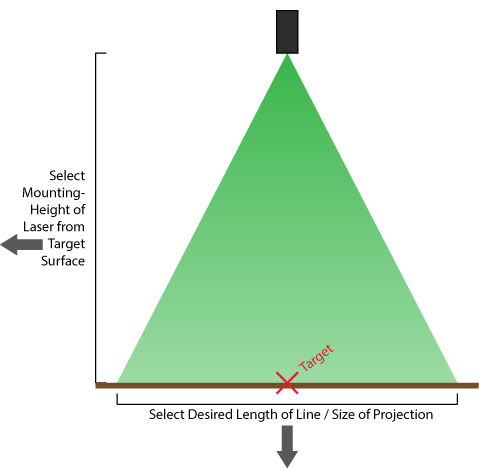 Use the slider on the left to indicate the laser mounting height, and the slider on the bottom to indicate the projection size that you desire. This will calculate the minimum fan angle you need to select for your desired projection. You should choose the smallest available fan angle that is still larger than this minimum value. If you cannot mount your laser directly above (perpendicular to) your target surface, click here.